When I first started hunting, I had no clue where to start with scent control. Sure I knew the basics, but not enough to be completely scent free. I would wash all my hunting clothing together but with Tide Scent-Free laundry detergent, I would refrain from using any scented lotion or perfume, but that was as where it stopped. Over the years, I have learned how propper scent control, leads to better experiences and shot opportunities in the field. By no means am I an expert, but I now have a system that works for me & maybe it will work for you. These are the four steps that I follow throughout hunting season to make sure I am scent free. For me, scent control starts at home. I machine wash all my hunting clothing together using Nose Jammer Laundry Detergent in cold water. During season prep, all my thicker jackets and bibs get washed. As season moves on those larger bulkier items only get washed as needed. I tumble dry the items on medium heat with Nose Jammer Dryer Sheets. After I pull everything out of the dryer, it's time to for it to hang dry. I like to make sure that everything has had a chance to air out and fully dry. While everything is on the line, I use Nose Jammer Field Spray and go through each piece and spray it down. It is just one extra step to make sure things are scent free. After a few hours on the line, everything comes down and get stored in my Watershed Dry Bags. They are waterproof, easy to store everything in, and keep my clothing scent free while in there. Last but not least! Time to spray down. 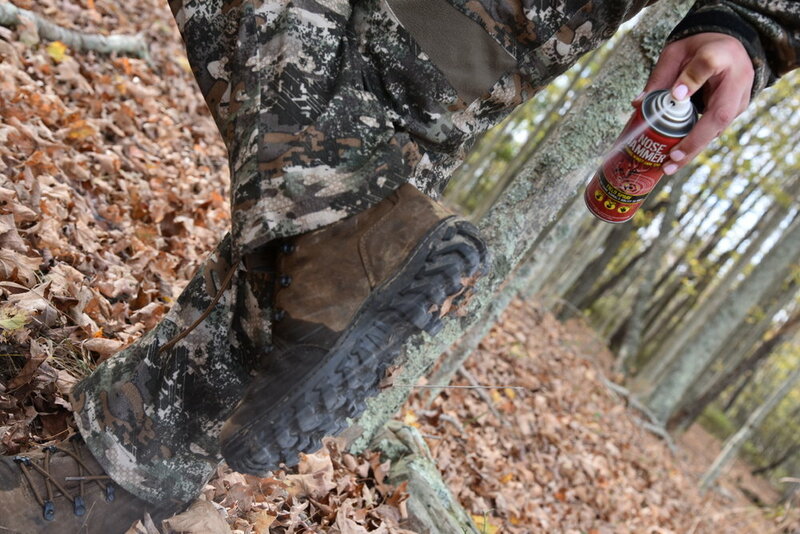 Right before I get into the woods, I spray down the bottom of my boots & a quick dusting on my jacket. And I'm ready to go. There are several great companies offering an array of products from shampoo to laundry detergent to field spray. Do your research, choose the one that works best for you! Personally I choose Nose Jammer. I have used them for 2 years nows and their wide range of products and science behind them is why I put my trust in them. Nose Jammer contains Vanillin and other natural aromatic compounds that have the ability to effectively jam an animal’s sense of smell. The compounds used in Nose Jammer are not alarming to game animals because they are found in lignin, a major support structure for all trees, grasses, and shrubs. The key is taking these prolific compounds game animals are conditioned to and delivering them at concentrated levels to overload the olfactory gland found in an animal’s nose. In the nose, once a molecule has triggered a response, it must be disposed of and this takes time. If a molecule comes along too quickly, there is no place for it on the olfactory hairs, so it cannot be perceived. Olfactory Fatigue is the temporary, normal inability to distinguish a particular odor after a prolonged exposure to that airborne compound. For example, when entering a restaurant initially the odor of food is often perceived as being very strong, but after time the awareness of the odor normally fades to the point where the smell is not perceptible or is much weaker. Just like an overly bright light can wash out a photographic image, Nose Jammer overwhelms the olfactory system and overpowers an animal’s ability to detect and track human scent. These are just my steps, everyone does something different but this works for me! If anyone has any other tips or suggestions leave them in the comments below. Older PostTop 10 Instagram Accounts. Promoting Women the Right Way.